Aluva is a quaint little town in the Ernakulum district of Kerala which is famous for its temples, rich culture, festivals and large river banks. Adding another feather in this city’s cap, Aluva railway station has set an extra-ordinary visual that has changed the stereotyped image of Indian railway stations. The scenario at this station was completely different earlier with broken tree stumps blocking the entrance and the uneven station premises. Thus the idea to revamp the station burped out and was initiated by Mr. Arun, the health inspector and equally supported by C.Balakrishnan, the station master, Mr. Mohan and Ms.Indu. 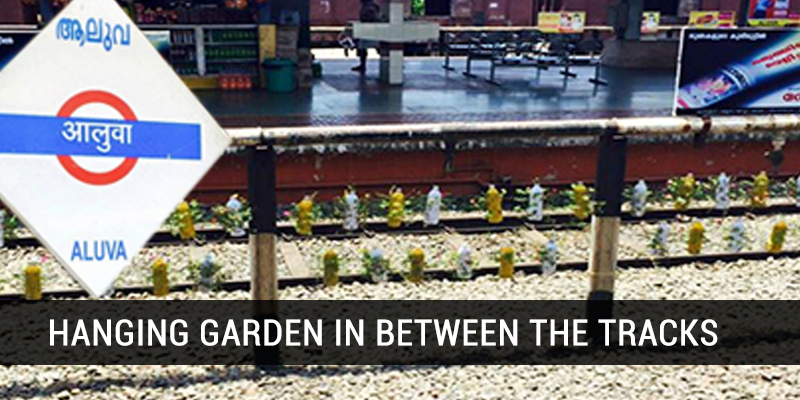 The plastic bottles were collected off the tracks by the station staff and China roses( a plant with low maintenance) was chosen to be planted in tiny plastic bottles painted in yellow and white colour. This gave it a form of a hanging garden. Not only this, they also cleared the weeds and branches, levelled the ground and set up a beautiful garden at the entrance itself. This initiative has not only served the beautification of the station but also to the utility purpose. In the recent times, more of unprecedented rail accidents had been in news due to commuters crossing railway tracks and this plan just hit the right chord. These plants and bottles that hang beautifully on the tracks act as barricades and don’t leave much space for the people to cross through which in turn encourages them to use foot-over bridges for crossing over to the other platform. Indeed this idea has gone beyond the aesthetic beauty for more of logical and practical purposes. Setting a wonderful environment-friendly example of cleanliness along with cost-effectiveness, this is an eye-opener for the otherwise eye-sored railway stations of India. It is surely a motivating instance of ‘Swachch Bharat’- two causes resolved with one single, simple solution! Excellent initiative from God’s own country …. Congratulations!! !